Longer hours, activities for the whole family and exciting new animals make the Two Oceans Aquarium Cape Town’s preferred family destination these school holidays. The Aquarium will be extending its hours during this period, from 09h00 to 18h00. During the school holidays, the Two Oceans Aquarium will, as always, be jam-packed with activities to keep landlubbers of all ages entertained, inspired, and warm. With the Aquarium’s extended hours from 16 March to 1 April (open from 09h00 to 18h00), there will be even more time to enjoy the wonders of this magical underwater world. We love our amphibious friends! In celebration of World Frog Day on 20 March, we'll be bringing you a whole week of frog-filled fun for Frog Week! From 18 to 24 March, daily activities will include live presentations of Western leopard toads at the I&J Ocean Exhibit daily at 13h30 and 15h00 and a fun, temporary interactive exhibit to help you discover all the marvellous habits of frogs. On Wednesday 20 March, the I&J Childrens' Play Centre will be hosting a special Wetlands, not Wastelands puppet show with loads of frog-themed kids' activities for the little ones. Ribbit! A face-painter will be taking up residence in the Aquarium to decorate your kids' faces with all things fishy, fantastic and fun! Find the painter in the Aquarium on the weekends, including Easter Weekend (that's 16, 17, 23, 24, 30 and 31 March and 19, 21 and 22 April). Discover a world of underwater oddities, like the strange colour-changing frogfish which uses its own fishing rod to catch its prey. 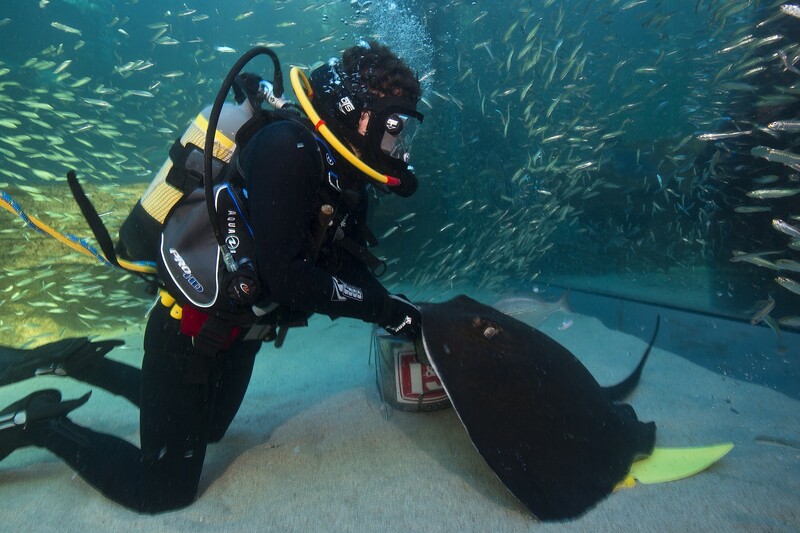 Every day a diver hand-feeds the rays and turtles in the I&J Ocean Exhibit at 12h00 - did you know that our short-tail stingrays are the biggest species of stingray in the world? At 14h00 every day, the fish in the I&J Ocean Exhibit receive a surface feed. During these feeds, a presenter provides insights and valuable information to those who have gathered to watch - that's right, our divers can talk to you from underwater! 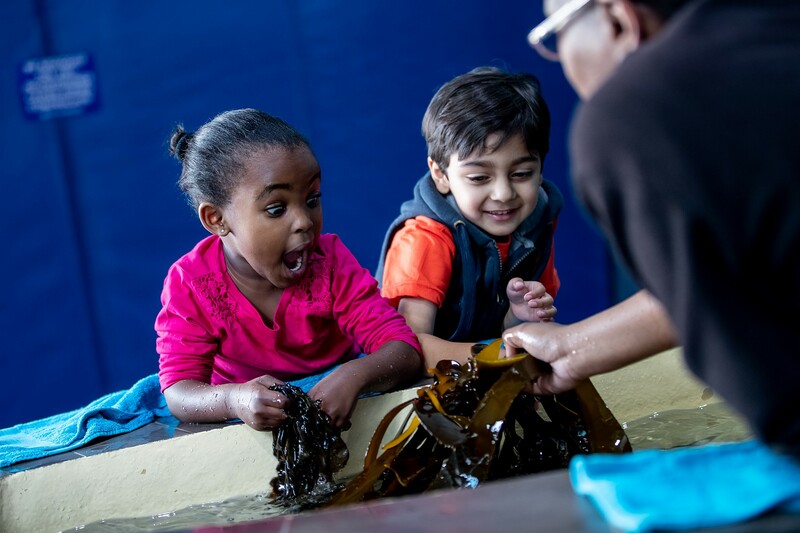 Get hands-on with South Africa's ocean heritage at a wide variety of interactive experiences - feel coastal seaweed and invertebrates at the Skretting Touch Pool, peek into the world of the tiny at the Microscope Exhibit, uncover a coelacanth fossil and climb inside a live-sized turtle shell at the Turtle Wall. The Aquarium’s I&J Children’s Play Centre will host a wonderful array of activities aimed at our younger visitors. 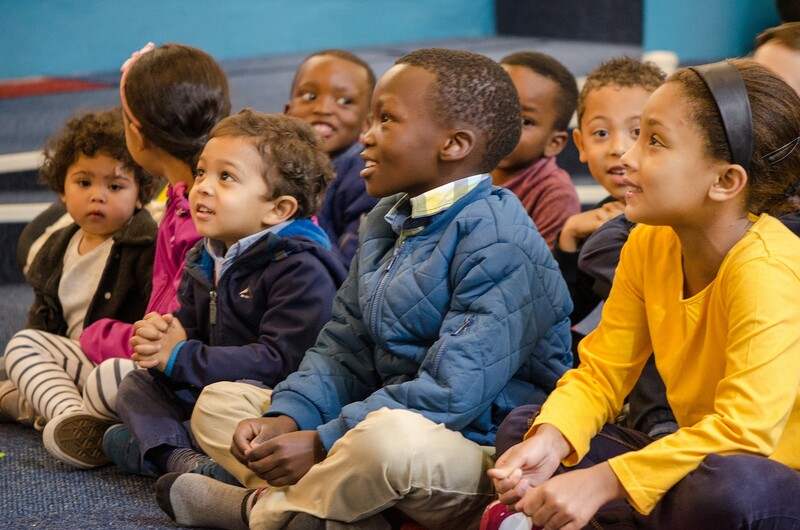 Interactive puppet shows with an important environmental message are held thrice daily at 10h30, 13h30 and 15h30. And if you can't get enough of the characters and their story, you can purchase a storybook to take home with you. Africa's only above-ground kelp forest is back! This iconic exhibit has become a fast favourite for children and adults alike, and with such an amazing diversity of iconic species, it's easy to see why. Every day at 13h00 our marine experts will hold a presentation in front of these giant algae - be sure to visit! The Aquarium's much-loved African penguins are fed daily at 11h30 and 14h30 - visitors receive an educational and informative talk about these charismatic and endangered birds while enjoying their feeding antics. If you want to get even closer to the rockhoppers, book a Penguin Experience and help our conservation fund. On 26 March 2019 we will be keeping our doors open until 21h00 for anyone who has an active Two Oceans Aquarium membership. On the day, the Aquarium will be open to the public as per usual from 09h00 to 18h00; thereafter our members will have exclusive access until 21h00. No ticket sales will be available on the evening, but our Visitor Centre will be open for membership sales and renewals. Click here to buy your membership today and gain access to this exclusive event. Skip the queue and get straight into the action with your family - get your Aquarium tickets online here. Want to come more than once? An Aquarium membership invited you a year of amazing perks and unlimited Aquarium visits.